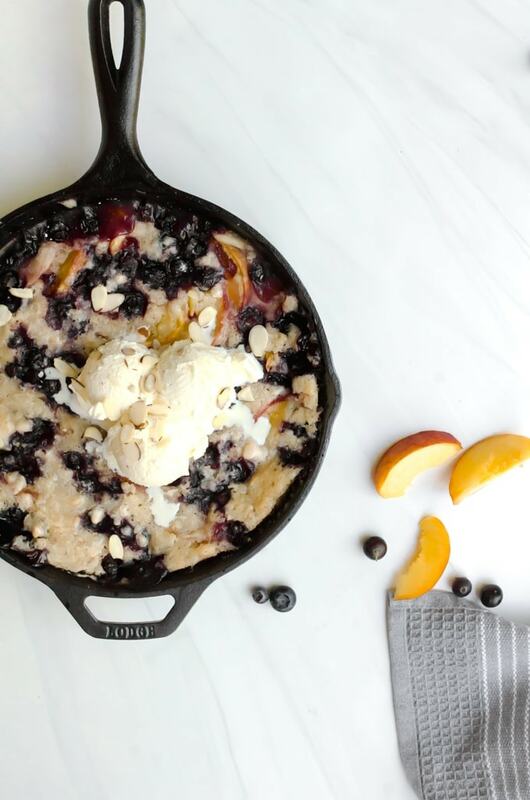 It isn’t summer without a peach blueberry cobbler on your table at the end of the day. 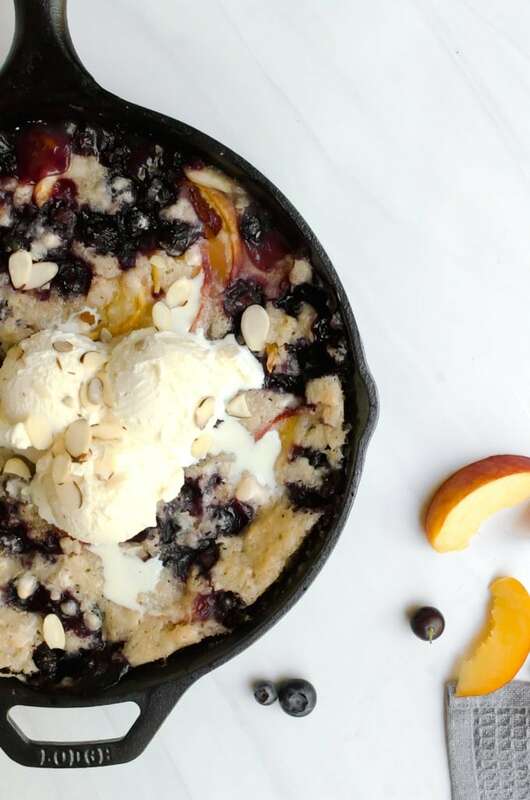 This cobbler recipe is so good, you’ll want it for breakfast too! I love a good, simple dessert. Something that doesn’t take much to prep, but tastes amazing every single time. That’s why when my family begs me for a dessert during times when I am between recipe testing, I make something like a rhubarb pear crisp or a peach blueberry cobbler. I love that the filing bakes up almost like that of a pie, but is less time consuming. 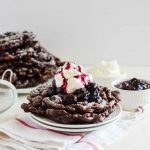 They’re so easy to whip together and are always a huge hit. Plus anything that takes advantage of all the fresh fruit of the season is always good in my books. We usually go fruit picking at our favorite local farm each year and buy nowhere less than 20 lbs of each fruit we pick, so anything I can bake to use up some of the fruit is definitely necessary! Even if you don’t go fruit picking, summer fruits are so cheap now that you can get away with buying a lot at once anyway. 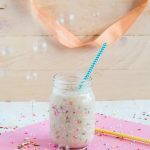 The recipe comes from Katie Lee’s Easy Breezy Eats. The book is full of all the best summer eats. It’s the kind of cookbook you need if you want to eat all the best summery food every day of the season. There’s even a whole chapter on burgers, tacos, and pizza. I mean, what could be better than that? Each recipe celebrates all that summer has to offer, and this peach blueberry cobbler is no exception. It’s the kind of cookbook my non-cooking sister got excited about and really wanting to try out a few recipes (not that she actually would cook, instead she will get everything and ask me to supervise and the next thing I know, I’m the one making it haha). 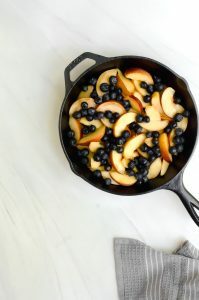 You can bake this peach blueberry cobbler in a regular baking dish, but I prefer to use a cast iron skillet. It conducts the heat better and shortens the baking time compared to a baking dish, plus it is much nicer presentation-wise. There’s a big debate on whether or not you should skin your peaches or not. Honestly, it’s up to personal preference. For me, the skin doesn’t bother me when its baked. Plus, I like to keep my prep as simple as possible, so keeping the skins on help with this. If you want to make the cobbler when the fruit isn’t in season, you can use frozen fruit. I’d just sprinkle the fruit with a bit of extra sugar and a couple of pinches of cornstarch since frozen fruit tend to release more liquid when baked. If you want to refrigerate your peach blueberry cobbler (it does not necessarily need to be refrigerated by the way), I highly recommend waiting until it is full cooled to room temperature. Technically, you can freeze the dessert, but I wouldn’t do it in the cast iron. I would transfer it to an airtight container, which would more than likely end with your cobbler top mixed in with the filling. That isn’t a completely bad thing, but ruins the aesthetics and turns the top to mush. To reheat the peach blueberry cobbler, you can use the microwave for a few minutes, or you can reheat it in the oven at 300 degrees F for about 20 minutes. Cobbler is good on its own, but let’s be honest, there is nothing like having a warm cobbler topped with melted ice cream. I love to add slivered almonds for a bit of crunch, too. Do it up and add any other topping your heart desires. I love how this recipe really lends itself to some creativity. 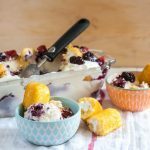 Don’t have time to make this amazing cobbler now? Pin it for later! 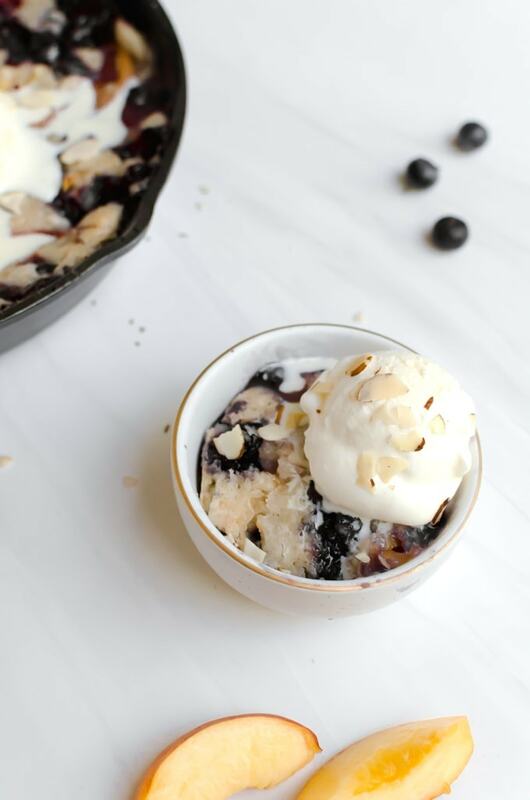 A super easy peach blueberry cobbler that will win your summer. Preheat the oven to 325 degrees F (164 C). Place the peaches and blueberries in your cast iron skillet and gently coat with the lemon juice. Add 3/4 cup (150 grams) of the sugar, flour, salt, and baking powder together. Stir well to combine. Stir in the melted butter and milk into the flour and stir until just combined. In a small bowl, mix together the remaining sugar and cornstarch. Sprinkle the sugar mixture over the batter, then pour the boiling water over the sugar. Bake for 55 - 60 minutes, then cool for at least 20 minutes before serving.